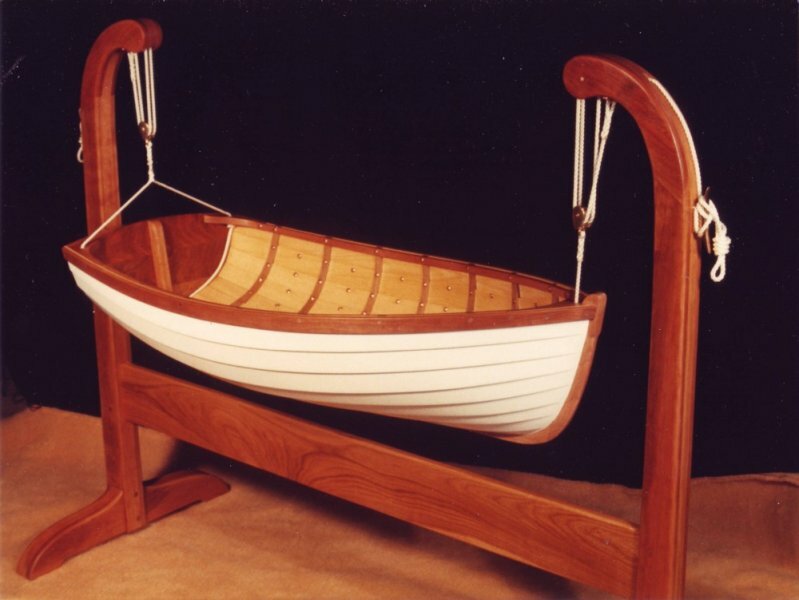 The cradle boat Baby Tender is an adaptation of the classic yacht tender carried aboard many of the finest yachts during the time when wooden boatbuilding was truly an art. The boat has a length of 45 in. and a beam of 22 in. Construction is traditional lapstrake planking on bent oak frames, copper riveted. Cradle boats have for centuries been a part of the maritime tradition of seafaring nations throughout the world, often being built by shipwrights and sailors for their first-born child and then passed down through the generations, becoming cherished family heirlooms. With the passing of the age of the wooden ship, this unique art form is seldom seen now except for some of the finer examples on display in maritime museums. With this in mind, I developed plans for my Baby Tender and Baby Tender II. The lines for both cradle boats are carefully adapted from classic boat types, and construction methods are traditional.